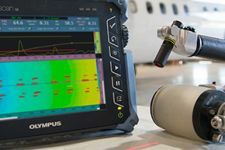 Olympus introduces the RollerFORM™, a new phased array wheel probe designed to address the inspection of composites and other smooth-surfaced materials, such as those commonly used by the aerospace industry. An affordable and easy-to-implement replacement for full 2-D encoding systems, the RollerFORM also offers a viable alternative to immersion techniques. The unique tire material of the RollerFORM has been specifically developed to guarantee high-quality, immersion-like ultrasonic testing. Minimal couplant and pressure is required for the RollerFORM to provide excellent coupling and a strong signal, even in difficult scanning positions. Exceptional coupling, requiring minimal couplant. Acoustic impedance similar to water. 25 mm water delay line enables inspection of composites up to 50 mm thick. Up to 51.2 mm wide beam coverage. Can be used in accordance with existing aircraft manufacturer procedures. Phased array probe with OmniScan connector. Waterproof encoder with OmniScan MX2 or SX compatible connector. Indexer and Start Acquisition buttons. The RollerFORM, combined with a phased array instrument such as an OmniScan® or the FOCUS™ LT, uses zero-degree ultrasonic beams for manufacturing and maintenance inspections. Common applications include delamination sizing and porosity quantification in composite core material, as well as wall-loss monitoring in aluminum panels. With its integrated indexing button, the ergonomically designed RollerFORM enables you to map the surface of an inspected material by acquiring multiple one-line C-scans and combining them in real time into a single image. The built-in laser guide facilitates straight and precise one-line scans. In addition to providing exceptional coupling, the tire of the RollerFORM wheel is made of a unique material that closely matches the acoutic impedance of water. This design feature permits the efficient transmission of energy to the part without unwanted echoes, obtaining an optimum 1 mm near-surface resolution in composites when using the 5 MHz phased array probe model. The 3.5 MHz phased array probe model is better suited for certain thicker, more attenuating materials. Since the tire is transparent, you can easily identify the presence of air bubbles or contaminants within the water chamber. Can the RollerFORM be used for applications other than aerospace? The RollerFORM design is optimized for inspection of defects present in the volume of CFRP panels that are 2 to 50 mm thick. However, there are certainly other applications for which the RollerFORM can be advantageous, keeping in mind that the maximum frequency available is 5 MHz and the maximum allowable surface temperature is 80 °C (maximum 2 minutes continuous inspection time). To explore the possibility for other applications, please contact your local Olympus representative. Can the RollerFORM inspect honeycomb panels? The RollerFORM can detect defects present in the volume of CFRP skin that is 2 to 50 mm thick. The RollerFORM can also be used for near-side detection of disbonding between CFRP layers (thicker than 2 mm) and honeycomb structures for certain material combinations. However, the BondMaster remains the recommended method for disbond detection between CFRP and honeycomb and for delamination detection in CFRP layers thinner than 2 mm. Can the RollerFORM be used for corrosion mapping inspection? Yes. Even though the HydroFORM remains the ideal choice for corrosion inspection, the RollerFORM is a suitable option for corrosion applications that do not require optimum near-surface resolution (NSR) or high frequencies. Furthermore, the RollerFORM can be particularly useful for quick checkups or when performing strip inspections on the longitudinal axis of pipes that are 4 in. OD or greater. The RollerFORM has a 3 mm NSR in steel (as opposed to 1.5 mm for the HydroFORM) and has a maximum frequency of 5 MHz. The HydroFORM is also better suited for integration with full 2-D mapping scanners.